You know those days when you wake up, get dressed and ready for the day, you're about to leave for work, and then you realize you have nowhere to keep you slice of pizza? Neither do we. But fortunately if that were a real problem now we'd have a possible solution. This otherwise normal plaid button-down shirt sports a triangular pocket made specifically to fit a slice of pizza. Tragically, this shirt appears to be little more than a figment of Pee-Wee Herman's imagination; it's not available for sale anywhere online. However, if you really did want a way to take a slice of pizza with you on the go, there’s always the portable pizza pouch. 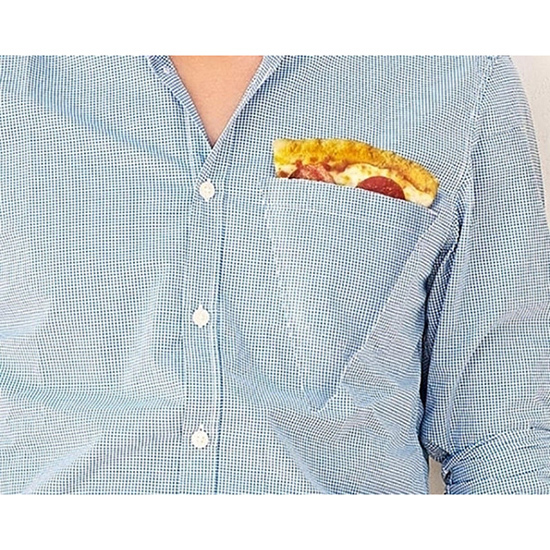 It doesn't have the grace and simplicity of the pizza pocket shirt, but it'll get the job done. If it was the pizza pocket that really appealed to you, no worries. You're still pretty much set. Just look up pizza pocket shirt and you'll see that you have a ton of options. They'll do, but alas none are as wonderfully bizarre as Pee-Wee's pizza pocket shirt.